Since the 1300s navigators and explorers have never left home without one—without an almanac, that is! Christopher Columbus found his almanac to be a lifesaver on his journey to the New World. In 1504, upon arriving on the Island of Jamaica, Columbus encountered hostile natives who refused to provide food and water for his crew. He read in his almanac that there was to be an eclipse of the moon and warned the Jamaicans that God was going to punish them for their lack of hospitality by making the moon go dark. The eclipse occurred, and the terrified natives promised to provide him with all the food he needed if he would only bring back the moon (story from the March 18 reflection). 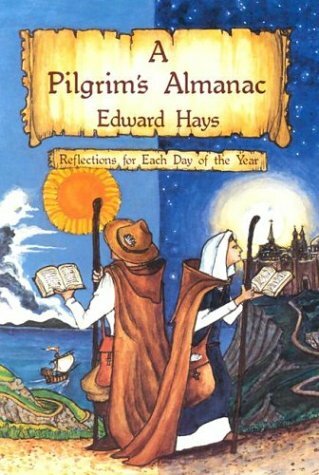 This almanac will be a life-and-time saver for anyone on a spiritual journey. Whether at home or on the road, there are 366 days worth of reflections that will help you navigate your way along the perilous razor's edge of the pilgrim's path. Containing a brief reflection for each day of the year, this almanac is appropriate for every year. It includes 165 more thorough insights (one page in length). Wise and challenging meditations that celebrate seasons, famous birthdays, dates of wondrous inventions, historical occurrences and sacred observances. The reflections are designed for those who have little time but a large hunger for the spiritual. Read as directed, it will provide a daily sustenance of creative insights into how to live a life that is whole and holy.